Successful businesses know the importance of timely and personal communication. Customers want to be informed throughout the entire customer experience. When they first decide to give your business a call, they want to speak with a person that can take care of them. And if you’re initiating the contact(or your salespeople), you need to ensure that the interaction is personal and genuine. They want to have a contact they can call if there is an issue, they want to know they'll fix anything that might go wrong. As a business grows, it might become harder and harder to keep those relationships personal. You have more customers to keep track of, more moving parts and you need to start delegating more work. Essentially, as the business grows, relationships can suffer. It is why many consumers opt for shopping at smaller, locally owned stores. They like that they can speak with someone that has ownership over customer satisfaction. While the number of lawns you’re mowing increases, there is a way to keep 1:1 communication consistent and effective. Here is how lawn maintenance software improves customer relationships. One of the reasons that customer relationships can go south is that the business doesn’t have enough information to keep 1:1 communication possible. Many times when lawn maintenance business grow, they lose the ability to foster relationships with their customers. Having a historical record of everything - work performed, communications, issues, any upsell opportunities - will help in creating a personalized experience for you and the customer. 1:1 communication becomes much more simple when you have information on your side. 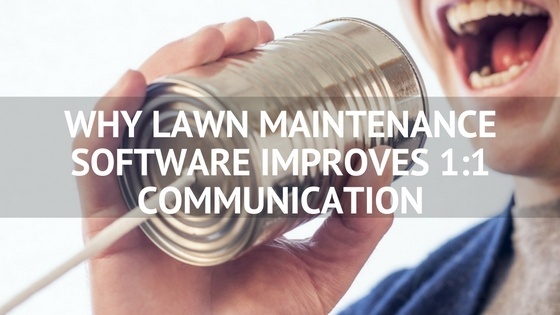 When used appropriately, lawn maintenance software can be a powerful tool in automating personalized 1:1 communications. This can come in the form of an automated completion email after you mow a customer’s property (with FieldCentral, our new lawn mainenance software, a Wrap-up Report will show a customer what work was performed and what else might be recommended). Or businesses can automate personalized confirmation emails specifying what day they will be visiting the customer’s property. These automated forms of communication save you time and help nurture 1:1 communication. Again, information is your friend. By using the information that you collect while out in the field, you’re able to become the “trusted adviser” for your customer. You’re able to make more informed recommendations about services that you provide. For instance, your main service might be mowing, but you also provide shrub or hedge trimming. From the information that your crews gather, you’ll be able to identify which customers even have these features on their property. By segmenting all the customers that fall into that category, you’re able to open the door to additional services. Customers feel a lot more comfortable with service providers that understand their needs. They know that they aren’t just blindly throwing out quotes or offers. Want to learn more about how lawn maintenance software improves your business? Click below to get more information on our newest lawn maintenance software, FieldCentral.